Automatic Litter Box Problems – Find the best automatic litter box here! If you have an electronic or battery-powered automatic litter box, there’s a lot that can go wrong. Even hand-operated boxes have their issues. Here’s a list of common automatic litter box problems and suggestions for fixing them. Waste is probably stuck in a spot that the litter box can’t reach, so it continually cycles in an attempt to clean it. Inspect the box for waste blockages and remove them manually. Some automatic boxes shut down if they are overfilled with litter. Remove some of the litter and try again. Alternatively, you might not be using enough litter. Most automatic boxes will not run if they sense a cat inside of them. This is a safety feature and it can’t be disabled. Ensure that the litter box is plugged into a power outlet. If it still doesn’t work, try a different outlet. If the box is battery operated, replace the batteries with fresh ones. Wipe the box’s sensor clean. If the sensor is dirty, it cannot detect waste and therefore will not run. Ensure that your cat meets the minimum weight limit for the box. Some boxes can’t sense a cat if it doesn’t weigh over a certain amount, such as 5 pounds. The box’s rake or waste disposal chute may be dirty. If your cat goes to the bathroom in the corner of the box, the cleaning mechanism might be unable to reach it. Remove this waste manually or move it to the center of the box so the mechanism can dispose of it. Some boxes, such as the Litter Robot, give off a powerful static charge when they’re brand-new. This can cause litter particles to cling to the interior of the box. As the static charge weakens, you may notice the litter dropping out the box and onto the floor. This effect will go away in a few days. The interior of your litter box may need to be manually cleaned. Over time, urine can seep to the bottom of any litter box. To clean, disconnect the box from its power source and empty out the litter. Wash the box with hot, soapy water. For extra stain-fighting power, wipe the interior with bleach. Allow the box to dry, then refill it with clean litter. You can also keep foul smells at bay with an anti-odor spray for cats. Here are a few options (click a product to buy on Amazon). Zero Odor Litter Spray – This fragrance-free litter spray is biodegradable, non-toxic, and non-allergenic. To use, just spray inside your cat’s litter box once per day. It’s got a total 4-star review on Amazon. 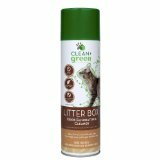 Green + Clean Litter Box Odor Eliminator – It’s fragrance free and made from all-natural non-GMO plant ingredients, such as sugar cane and cellulose. It works in the litter box and on surfaces, such as the floor or wall. MrGreen Cat Litter Box Deodorizer – This spray uses organic compounds and amino acids to attack foul odors. It’s all natural and EcoLogo Certified. McGreen spray has a pleasant lemongrass scent that most Amazon reviewers praise. 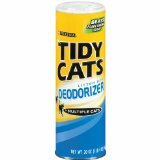 Tidy Cats Litter Box Deodorizer – This product has received an impressive total 5-star review on Amazon. It’s a powder that you sprinkle over your cat’s litter box. Use it as a daily freshener or to cover up your cat’s recent waste. 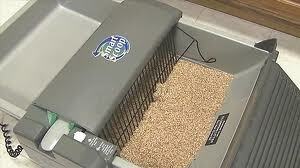 To return to the Automatic Litter Box Reviews comparison chart, click here.